Things to Come (also known in promotional material as H. G. Wells’ Things to Come) is a 1936 British black-and-white science fiction film from United Artists, produced by Alexander Korda, directed by William Cameron Menzies, and written by H. G. Wells. The film stars Raymond Massey, Ralph Richardson, Cedric Hardwicke, Pearl Argyle, and Margaretta Scott. The dialogue and plot were devised by H. G. Wells as “a new story” meant to display the “social and political forces and possibilities” that he had outlined in his 1933 story The Shape of Things to Come, a work he considered less a novel than a “discussion” in fictional form that presented itself as the notes of a 22nd-century diplomat. The film was also influenced by previous works, including his 1897 story “A Story of the Days to Come” and his 1931 work on society and economics, The Work, Wealth and Happiness of Mankind; speculating on the future had been a stock-in-trade for Wells ever since The Time Machine (1895). The cultural historian Christopher Frayling called Things to Come “a landmark in cinematic design”. In the British city of “Everytown”, businessman John Cabal (Raymond Massey) cannot enjoy Christmas Day, 1940, with the news everywhere of possible war. His guest, Harding (Maurice Braddell), shares his worries, while his other friend, the over-optimistic Pippa Passworthy (Edward Chapman), believes it will not come to pass, but if it does, it will accelerate technological progress. An aerial bombing raid on the city that night results in general mobilisation and then global war. Cabal, now piloting a biplane, shoots down a one-man enemy bomber. He lands and pulls his badly injured enemy (John Clements) from the wreckage. As they dwell on the madness of war, they have to put on their gas masks, as poison gas drifts in their direction. When a little girl runs towards them, the wounded man insists she take his mask, saying he is done for anyway. Cabal takes the girl to his aeroplane, pausing to leave the doomed man a revolver. The man dwells on the irony that he may have gassed the child’s family and yet he has saved her. A gun shot is then heard. The war continues into the 1960s, long enough for the people of the world to have forgotten why they are fighting. Humanity enters a new Dark Age. The world is in ruins and there is little technology left, apart from the firearms used to wage war. In 1966 a biological weapon called the “wandering sickness” is used by the unnamed enemy in a final desperate bid for victory. Dr. Harding and his daughter struggle to find a cure, but with little equipment it is hopeless. The plague kills half of humanity and extinguishes the last vestiges of central government. By 1970 a local warlord called Rudolf, but known as the “Boss” or “Chief” (Ralph Richardson) has risen to power in southern England and eradicated the sickness by killing the infected. He dreams of conquering the “hill people” to obtain coal and shale to render into oil so his biplanes can fly again. On May Day 1970, a sleek, futuristic aeroplane lands outside of what remains of Everytown. The sole pilot, John Cabal, emerges and proclaims that the last surviving band of “engineers and mechanics” have formed a civilisation of airmen called “Wings Over the World”. They are based in Basra, Iraq and have renounced war and outlawed independent nations. The Boss takes the pilot prisoner and forces him to work for Gordon, a mechanic struggling to keep the Boss’s remaining aeroplanes flying. Together, they manage to repair one of them. When Gordon takes it up for a test flight, he leaves to alert Cabal’s friends. Gigantic flying wing aircraft arrive over Everytown and saturate its ruins and population with sleeping gas globes. The Boss orders his biplanes to attack, but they prove to be ineffective. The people awaken shortly thereafter to find themselves under the control of the airmen of Wings Over the World and the Boss dead from a fatal reaction to the sleeping gas. Cabal observes, “Dead, and his old world dead with him … and with a new world beginning”. All is not well, however. 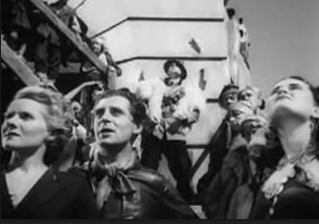 The sculptor Theotocopulos (Cedric Hardwicke) incites the populace to demand a “rest” from all the rush of progress, symbolised by the coming first manned flight around the Moon. The modern-day Luddites are opposed by Oswald Cabal, the head of the governing council and grandson of John Cabal. Oswald Cabal’s daughter Catherine (Pearl Argyle) and Maurice Passworthy (Kenneth Villiers) insist on manning the capsule. When a mob later forms and rushes to destroy the space gun, used to propel the projectile toward the Moon, Cabal launches it ahead of schedule.